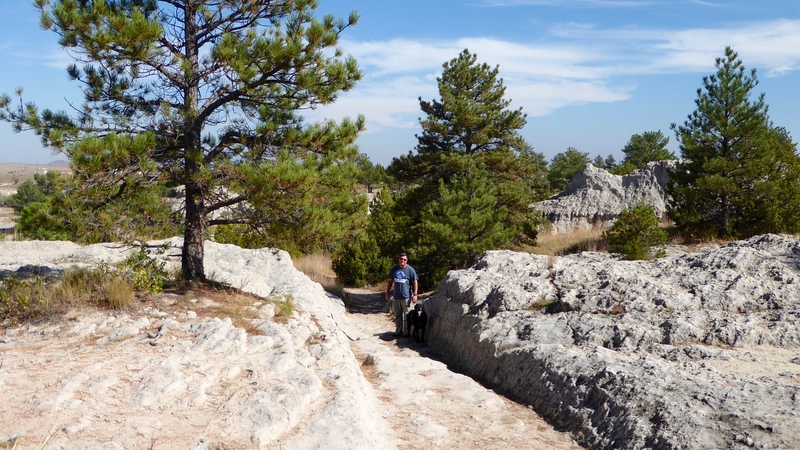 After leaving Devils Tower, we headed south to Guernsey State Park. 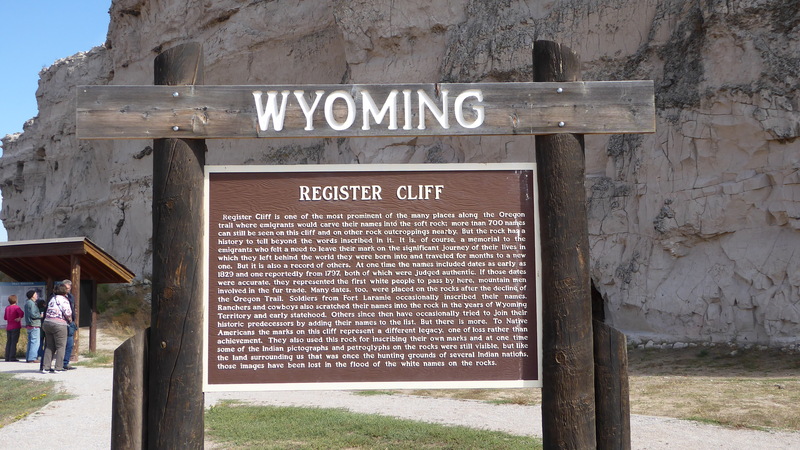 The trip involved a fair amount of concern on my part because Wyoming parks do not take reservations after September 15. This park has only a small number of water and electric sites. Would one be available? Would water even still be running this late in the season? From the website, I knew one section of the park was closed for road construction but couldn’t tell if that was the area with hookups. My phone calls to the park went unanswered and unreturned. All of that angst explains why we almost always have reservations. If the reservations end up needing to be changed, so be it, but we like knowing we have a place that will meet our needs. As it turned out, we didn’t have a problem finding a site! We weren’t always the only ones in the campground but usually so. One of the things we really enjoyed here were the trains that went by almost continuously, a sound that is appealing to both of us. 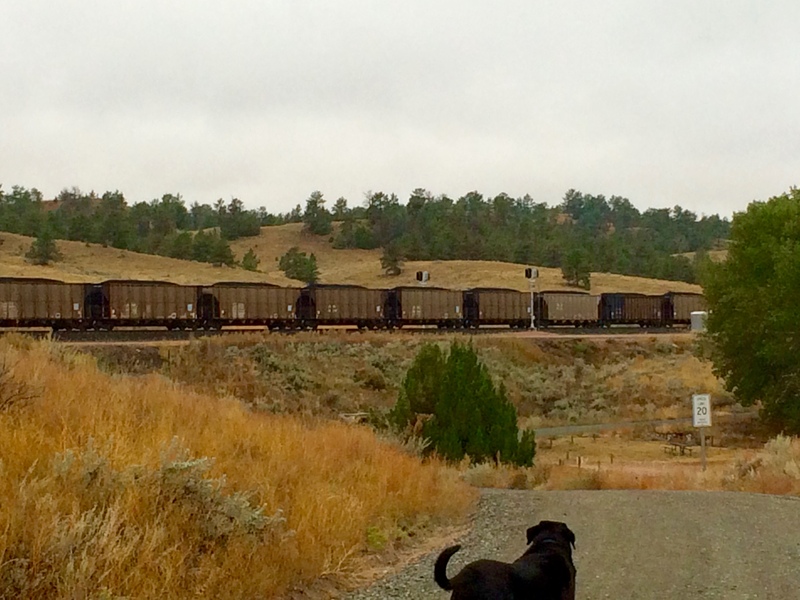 Coal mining and transport is huge in this area. There are a number of Civilian Conservation Corps (1930s) buildings on site. 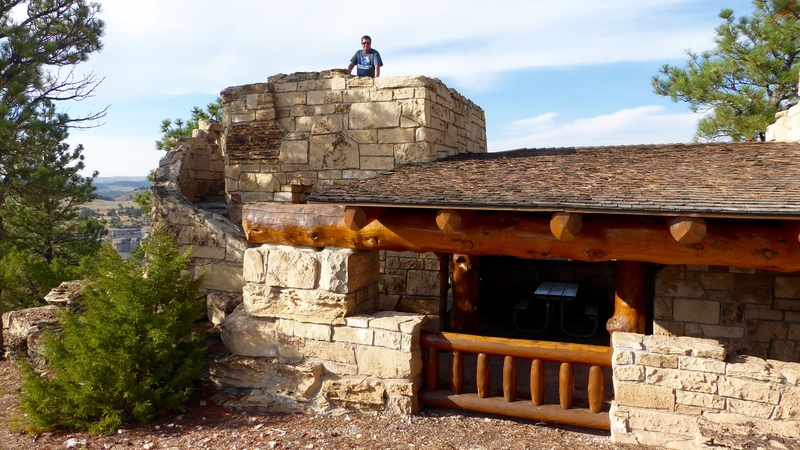 We saw several including this small storage building and The Castle, the nicest picnic shelter we’ve ever seen. In Guernsey there are two significant Oregon Trail sites. Register Cliff is one of the places along the trail where emigrants would carve their names in the sandstone, letting others know they had made it that far. 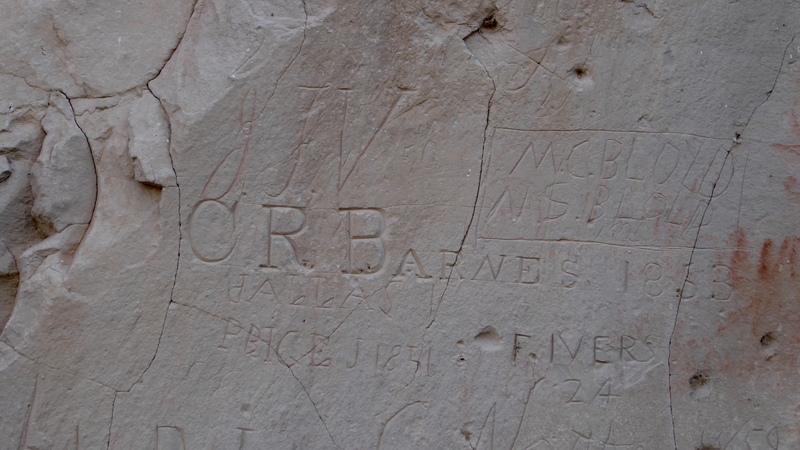 Along a couple hundred yards, there were thousands of names, some period to the Oregon Trail, some current, and every year in between. We also saw ruts cut into the rock by thousands of wagons going through this area on the California, Oregon, and Mormon Pioneer Trails. 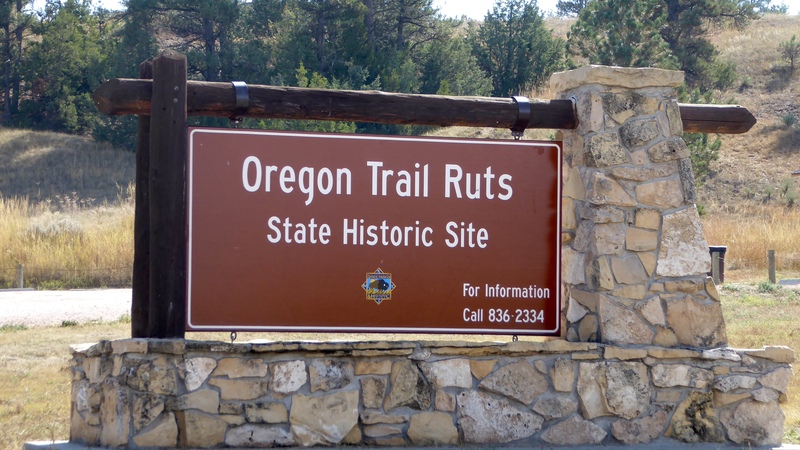 We have been fortunate enough to have seen southern Idaho Oregon Trail ruts (thanks Jerry!) but the depth of these ruts cut into the rock is impressive. Elko and Randy are walking in the ruts to give perspective. Fort Laramie was our next destination. There are a collection of buildings and ruins at the site. 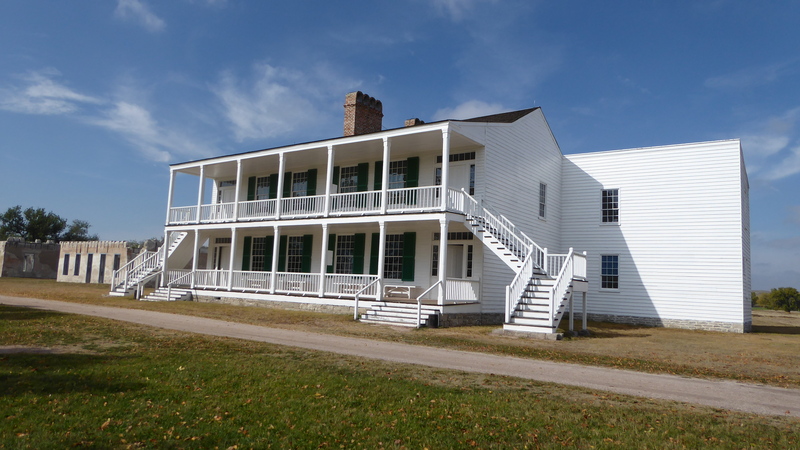 Some have been restored and furnished to reflect what they would have looked like during the fort’s active duty. Commander’s House – Furnished and open for viewing! Among them is “Old Bedlam,” so named because of the boisterous sounds coming from within. 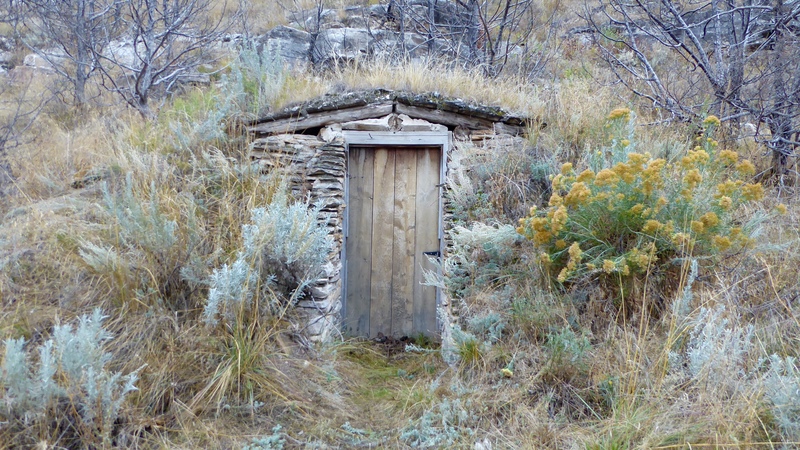 It was built in 1849 and is the oldest building in Wyoming. Additionally, Wyoming’s first public school began in1852 and served children living at Fort Laramie. 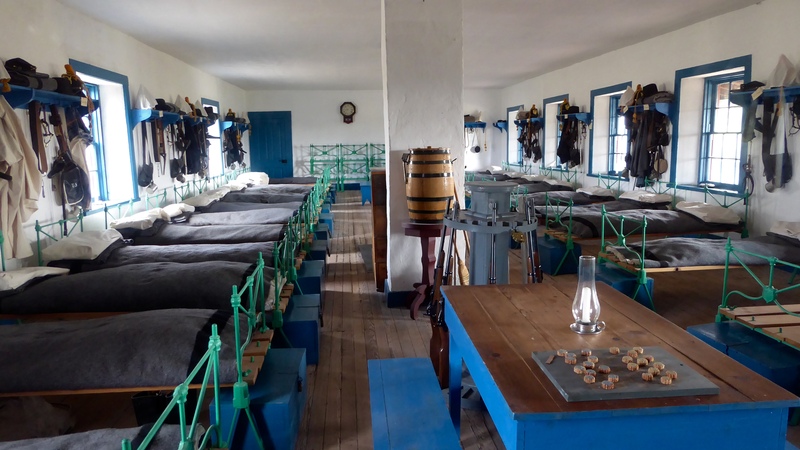 Fort Laramie began as Fort William in 1834 as a gathering place for trappers and traders. 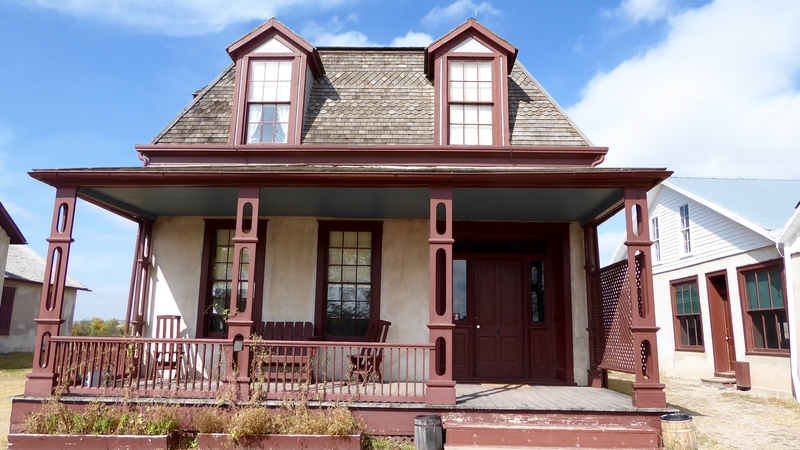 In 1841, circumstances changed the fort’s role to serving westward bound emigrants. 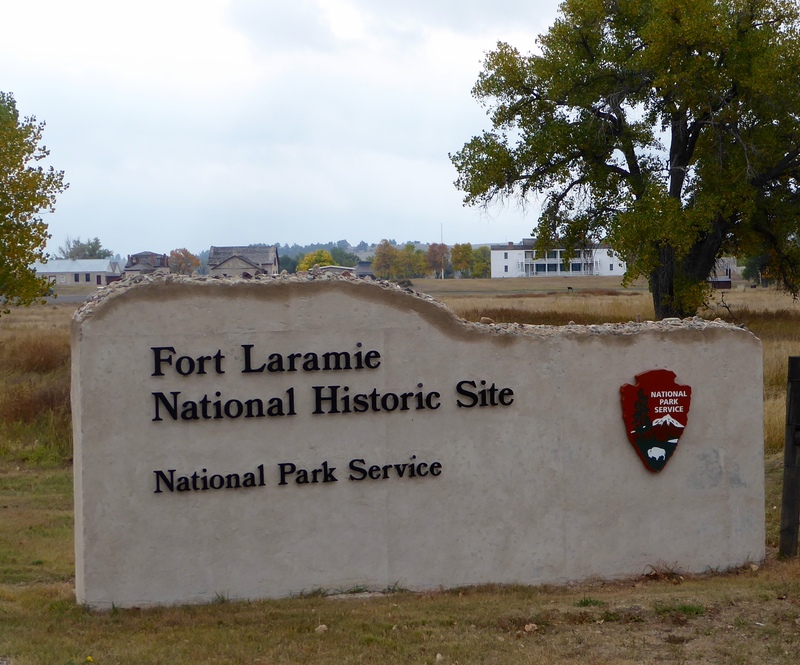 In 1849 the US Army purchased the fort, renamed it Fort Laramie, to establish a presence in the northern plains. Additionally, stage lines, the Pony Express, and transcontinental telegraph all went through Fort Laramie. Several treaty negotiations with Northern Plains Indians were held at the fort, notably those in 1851 and 1868. Relations with the Indians were generally good until a single event in August, 1854. A cow, belonging to Mormon emigrants, wandered into a Sioux village near the fort and was killed by a visiting brave. Although the Brule-Sioux offered to make reparations, brash young Lieutenant John Gratten from Fort Laramie mishandled the situation, insisting on arresting the responsible brave. The end result was that John Gratten, all 29 members of the army detail and the Chief of the Brule-Sioux were killed in what became known as the Gratten Massacre. Even though Gratten’s detail had been the aggressors, government and public opinion began to turn against the Indians. Historians believe this event triggered three decades of Indian Wars. Our next stop was the Terry Bison Ranch (and RV park) south of Cheyenne. The ranch is home to the second largest bison herd (approximately 3000) in the United States. (Ted Turner owns he largest bison herd, 51,000 animals.) There is a small herd of about 40 bison that are available for guests at the ranch to view and feed. A small train takes you out to the herd. 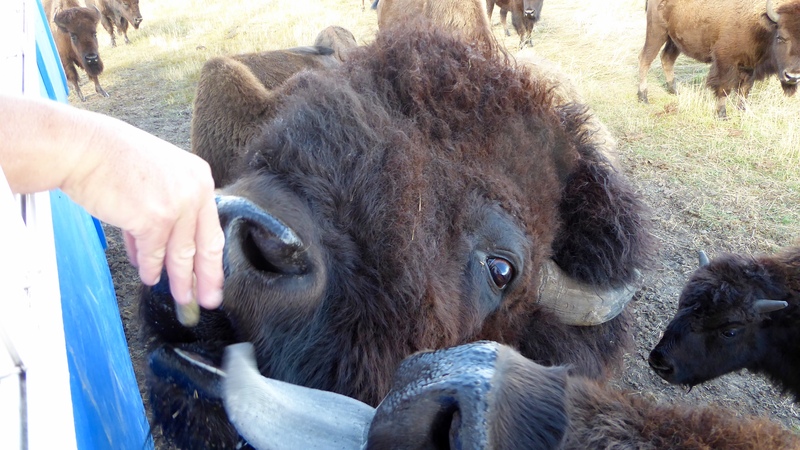 This is Randy’s hand feeding two eager bison. The ranch train is the only privately owned interstate railway. 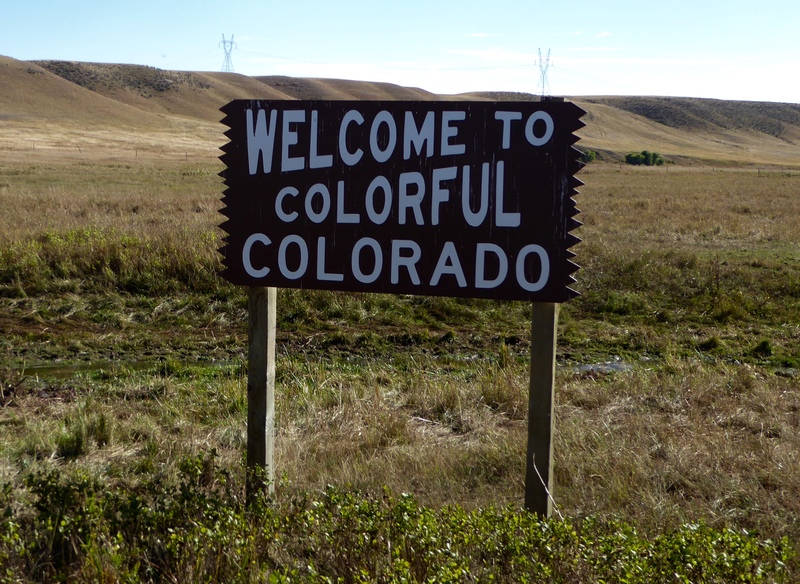 The train crosses in to Colorado for about 200 yards and then goes back into Wyoming! Bison meat is leaner and contains more protein than beef. A restaurant on site serves bison and we decided to try it out in the forms of a bison burger and bison chicken fried steak. Both were delicious. 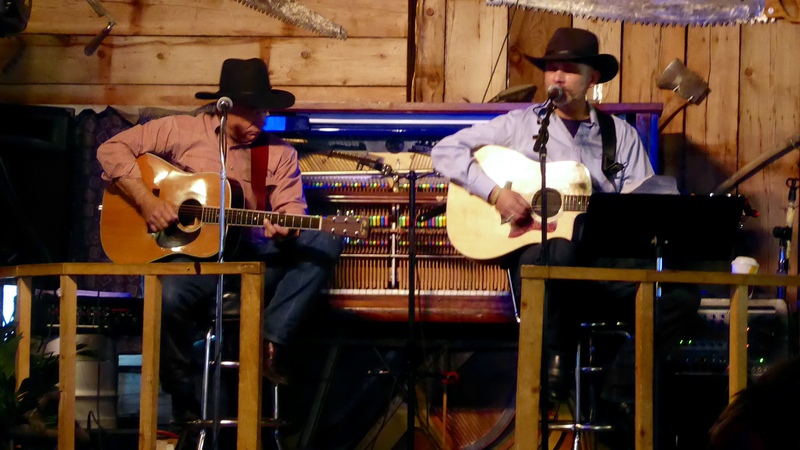 We also enjoyed some local music while we were eating. 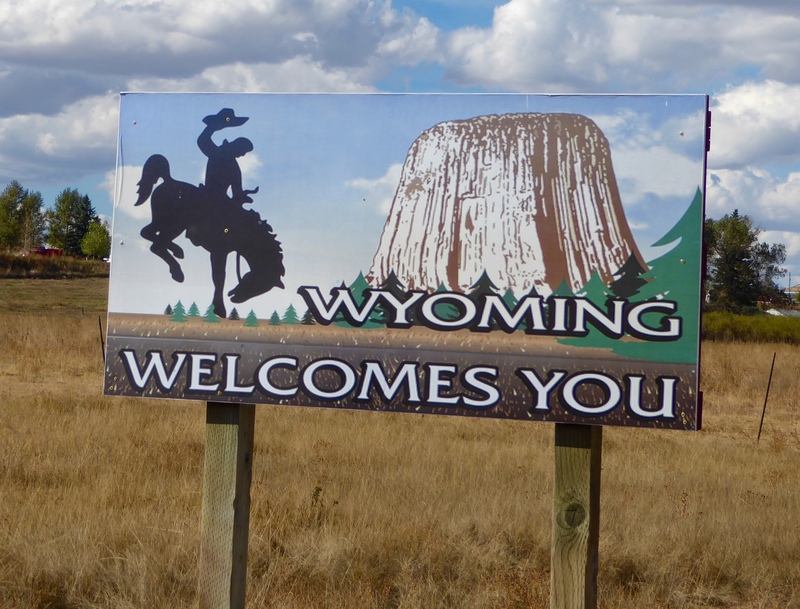 We are not done exploring Wyoming but, like the train, we are taking a brief detour into Colorado. We will be at the Boise State vs Colorado State football game on Saturday. Go Broncos! 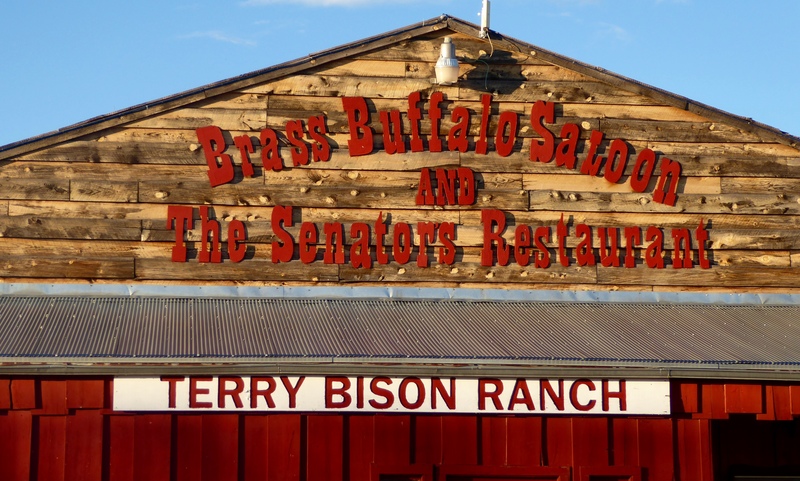 We stayed at the Terry Bison Ranch back in 2010. Part RV park, and part Petting Zoo! But you guys have had to revert back to “Bison” from “Buffalo”. How confusing is that. Fortunately it was easier to go back to bison than it had been to think buffalo! 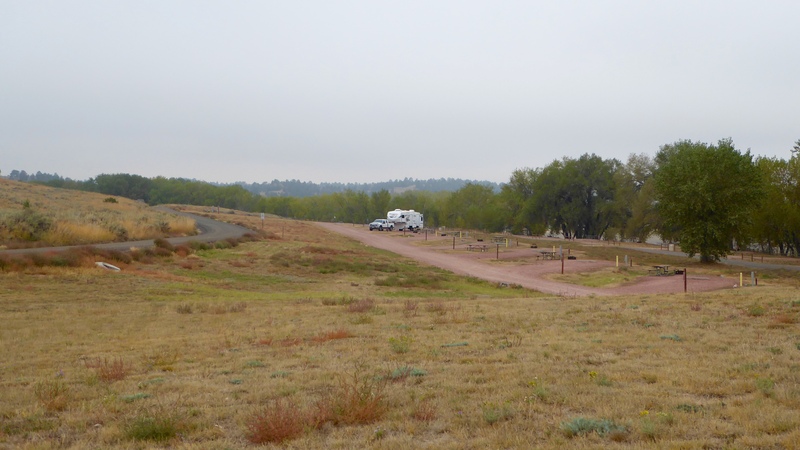 We weren’t big fans of the rv park at the ranch, but also probably not seeing it at its best time. The county park we’re in now is 10 times better and half the price! Serene, that is a great photo of the bison on the tracks! Can we chat (phone or email) about photo usage please?